BenQ has launched a series of monitors designed to reduce eye strain caused by rapid 'flickering', a flashing-type effect found on LED displays. Flickering occurs when an LED display is set to anything under maximum brightness, which is controlled using technology called Pulse Width Modulation (PWM). PWM dims the display by rapidly turning the LED backlight off and on at varying rapid speeds depending on the user's desired brightness. This takes place at such a speed that it is undetectable to the human eye. According to BenQ, the problem is that flickering occurs at 200Hz per second when brightness is reduced, resulting in millions of 'flickers' every day, contributing to eye strain, headaches, and occasionally nausea. To combat this, BenQ has introduced a range of Eye-Care 'Flicker Free' monitors based on a Direct Current backlight system where PWM is not used. BenQ says it is introducing the technology, which uses more complicated circuitry and has so far been found on more expensive models offered by its competitors, for no extra cost across the new range. The company points to several other factors that contribute to undesirable flashing effects on LED monitors, including setting the incorrect refresh rate, using poor quality analogue cabling, misconfigured graphics cards, and interference from nearby devices. As such, the company says businesses opting for its 'flicker free' monitors would benefit not only from potentially reduced eye strain, but also from a simplified 'plug and play' setup that provides an instant configuration using a supplied HDMI cable. 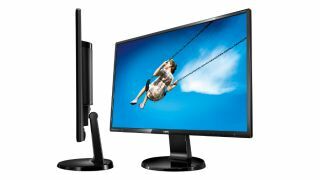 The first display in the range, BenQ's GW2760HS, is being made available in June for £209.99. It features a 27-inch 1920x1080 pixel-resolution screen, in-built speakers, and several connectivity options including D-Sub, DVI and HDMI input. Speaking to TechRadar Pro, BenQ UK Product and Distribution Manager Mark Adams said that many people incorrectly thought the problem of screen flicker had gone away when organisations moved from older CRT display to newer LED models. He said: "LED monitors are widely used now, and they're all causing eye strain, so flickering has become more of an issue. We don't want to scare anybody, but if you are using one of these monitors, then it's probably causing this undesired effect. "It's only since the world has adopted LED that this has become more of an issue. The health of our users using our monitors eight hours a day is important, so we have come up with this direct current technology to solve the problem."